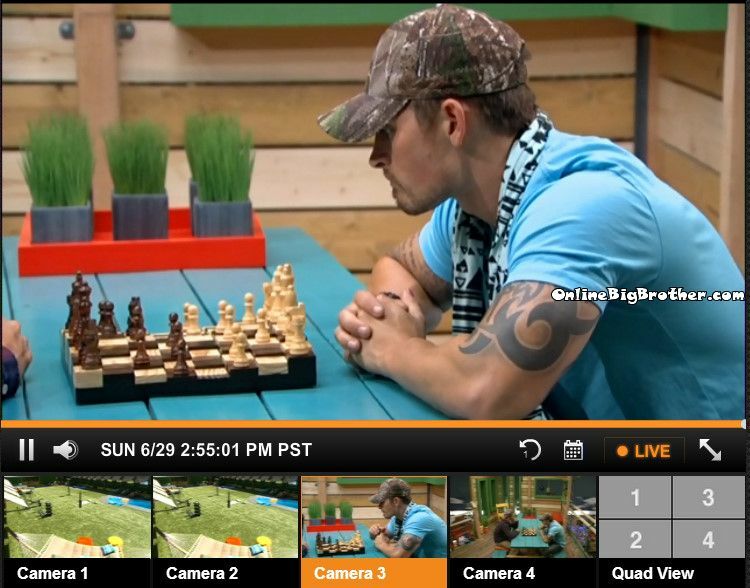 2:55pm Chess Game Caleb and Hayden Caleb and Hayden agree Joey is going home. 3:20pm Nicole, POWPOW and Brittany poolside chit chat. Nicole joins them..
Donny is pointing out how Christine has been hanging out a lot with the guys. Derrick says it’s early in the game the just have to go with the hand they are dealt depends on who won HOH will change the entire outcome. Donny wonders if a close friend wins it again if the targets will be the same. Derrick thinks it will be like this week the person falling off the HOH will be the nominee. Brittany wants to help out her parents they’ve been so supportive of her. Amber joins them. they start talking about how bad they feel for having to vote someone out they like everyone. They start talking about their vehicles they own. Amber says she use to own a G35. Joey joins them says she has a infiniti g37. Caleb says new trucks are screwing with all their “Electronics” he thinks the best vehicle are older diesel. Did anyone notice Caleb is wearing Amber’s dress around his neck. Again I say creepy stalker!! How is showing she likes him or leading him on? Hayden is the guy she hangs out with the most. Everyone has told her that Caleb REALLY likes her but she hasn’t said she likes him more then just a friend. He’s already talking about them getting married!! And it is stalking if he has to know where she is and who she’s talking with every moment…not for game play but because he wants her. He even said he knows what she thinking and yet they spend almost no time together. I guess if “not” telling him that she doesn’t like him that way is leading him on then Amber is leading him on. Otherwise I don’t see how she could be seen as leading Caleb on. Please do not insult Wolverine!! Forgot to add the word fame. He doesn’t remind me of Wolverine. His nemesis, Sabertooth, is who comes to mind. I was rooting for him going into the house. What a huge disappointment. After seeing this episode tonight Devin is officially my least favorite cast member now…..what an idiot! Apparently he’s been told he resembles The Rock and he really thinks he is that hot, even doing the eyebrow things that The Rock does. Sorry Devin, you are NOT that hot and you are NOT Dwayne Johnson! I swear Nicole is actually one of the funniest in the house. I wasn’t a big Christine fan at first, but I’m loving this nerd girl alliance. Do I think they have the skill to go to the end? No, at least not from what I’ve seen. But I hope we see more of Nicole at least and she comes out of her shell a bit more.